They say you never forget your first… Marathon! I mean marathon! What did you think I was talking about? 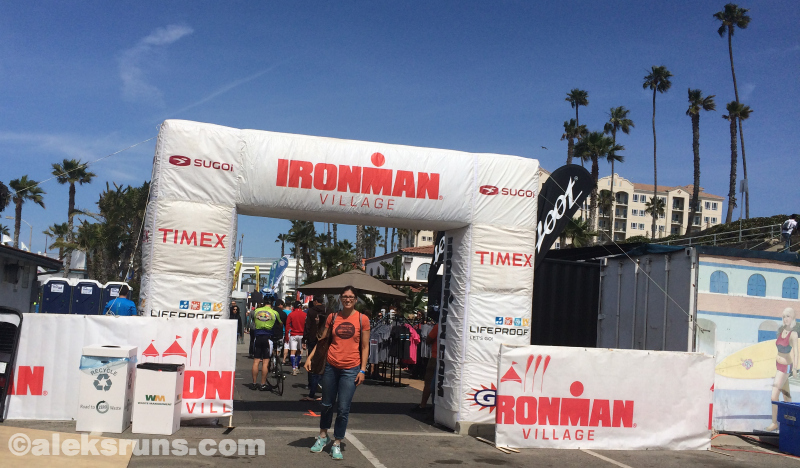 My first half ironman? Some of it I forgot quickly. Like the now blurry memories of stomach cramps and queasiness and “Oh I wish I could just throw up and get it over with already!” during the run. But the experience overall? Can’t wait for the next one! 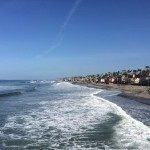 We stayed at the Oceanside Marina Suites: beautiful property, just renovated and overall a fantastic place. 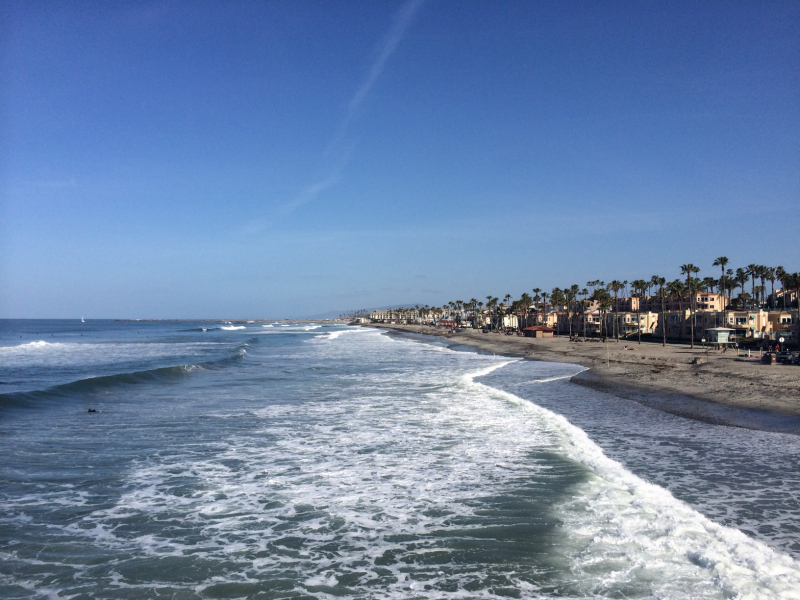 About two miles from all the action at Oceanside Pier, so it’s quiet in the evenings – but a very short drive from night life and right on the beach! We arrived at Oceanside on Thursday evening, two days before the race and just in time to enjoy the beautiful sunset from our hotel room. After a day of driving (and with a week’s worth of a good taper), I felt rested and ready to race. 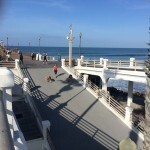 The ocean was calm in the harbor, but since swimming wasn’t allowed on the course – and I had instructions to go on an easy run the day before – there was no pre-race swim. An easy 30-min run on Friday and riding the two miles to T2 to drop off my run gear and back was all the shakeout training I got… yet my FitBit numbered 25,000+ steps for Friday. Oops. 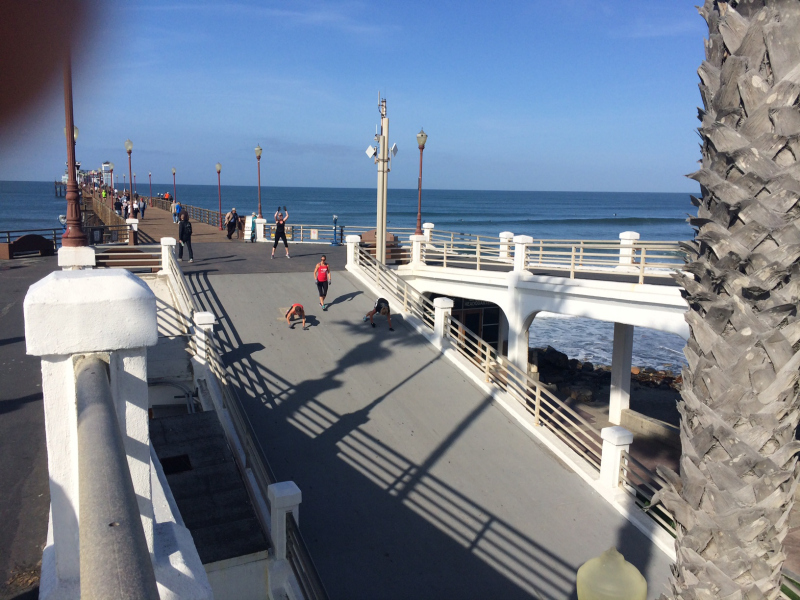 A bit too eager, as usual, to walk all around the expo (several times), not to mention the beautiful Oceanside beachfront. Jesse Thomas: such a cool dude. He pulled out of the race because of injury, but is still on the pro list for Wildflower. Hope you win, Jesse! 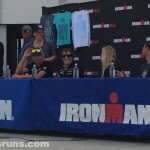 The Pro Panel featured last year’s winners – Andy Potts (first from left, with blue trucker hat) and Heather Jackson (lady with trucker hat with W on it); 2012 Ironman World Champion Pete Jacobs, Ironman 70.3 World Champion Sebastian Kienle; some actress – blond hair – who’s been on the Bold and the Beautiful for 26 years (!! 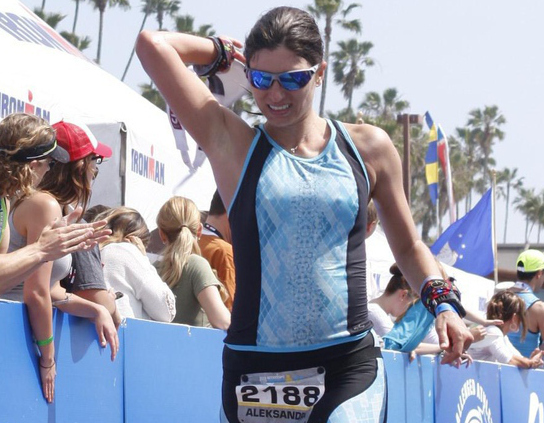 talk about endurance), and two athletes competing for the Challenged Athletes Foundation. Neither of these peeps won the race the next day, but it was so cool to see them up close and hear about their race plans and training so far. 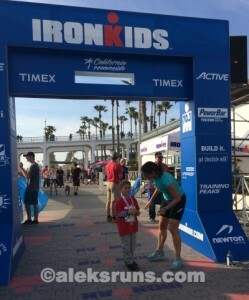 While I was having a fab time at Ironman Village, KidRuns and HusbandRuns spent the day at Legoland – and came back in the early afternoon so KidRuns could partake in the Kids Run. Except KidRuns – sleepy and tired from his Legoland adventures – refused to run was practically over… then decided he does want to run, after all. 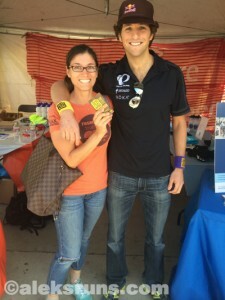 Many thanks to the organizers for still letting him do the half-mile distance and giving him a medal and goodie bag. No official welcome to the finish from Mr. Voice of Ironman, but there were lots of people around to clap and cheer for him. Now he keeps saying this is his favorite race ever. OK then! Woke up at 4 a.m., fully rested and ready to go drink coffee! My mom groggily wished me a Happy Birthday from the fold-away couch, because yes: what better way to celebrate your aging than with 2,500 people at an Ironman party? 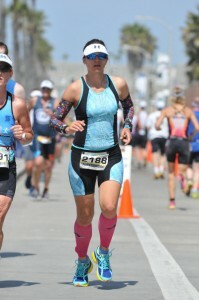 After breakfast – a Cliff bar, a banana (very ripe, almost black) and two cups of coffee – HusbandRuns and I headed out to walk the one mile from our hotel to T1 and the swim start. 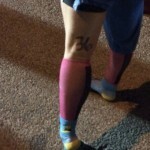 It was still dark when we got there, I found my spot on the rack (all ordered by bib number) and went over to get body marked. 36 years old now. No going back. It was quite chilly out and just the thought of getting in the water gave me the heebie-jeebies. 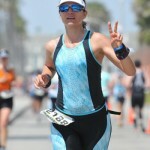 But our slow walk to transition that morning meant I had barely an hour before the race start – and it went by quickly. I squeezed into my wetsuit – that helped a lot with the cold, actually! 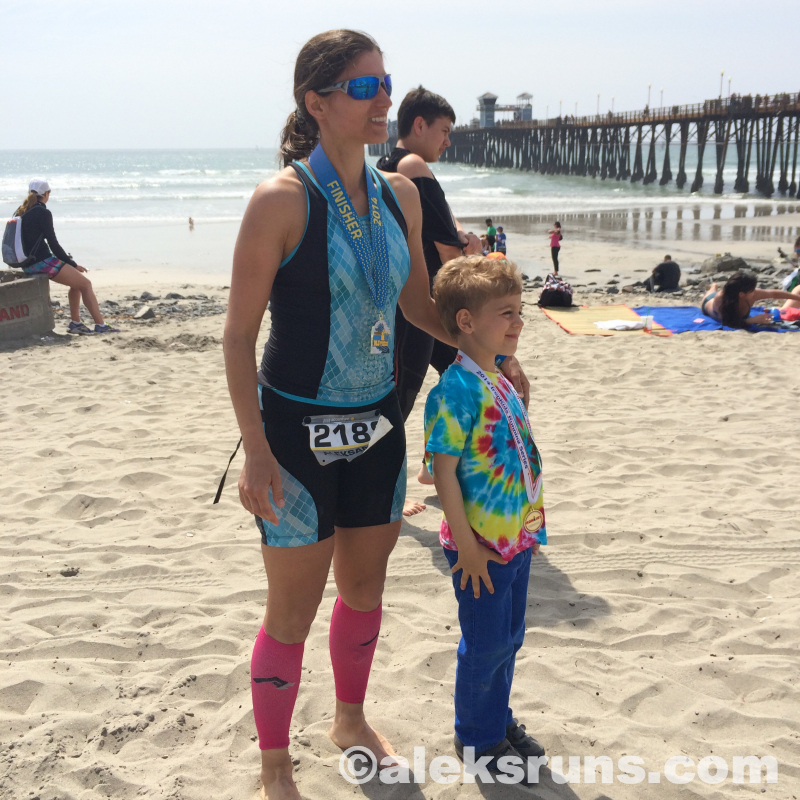 – quickly exchanged socks with the Husband and off we went towards the swim start! 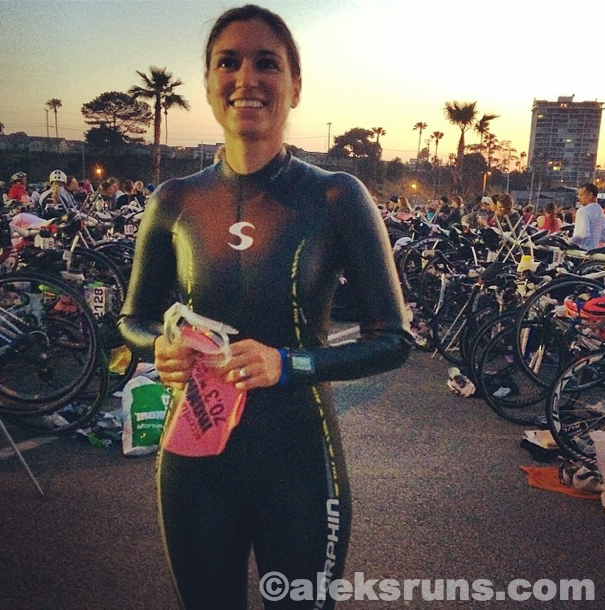 Used some Instagram filtering to make this one a bit lighter – it was still pretty dark out, but the wetsuit made me all warm and toasty and excited! At 6:30, the male pros officially kicked off the race and we started lining up neatly into our waves: 23 in all, based on age group. 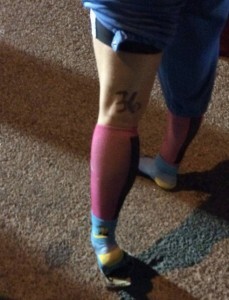 I was wave 16, starting at 7:27, which meant I had nearly an hour to meditate fiddle nervously with my goggles and swim cap and chat with my fellow age groupers. One of them said something that stuck: “Let’s do this, ladies! I’m so proud!” Yes! Exactly! Proudest moment of the day: lining up with my fellow athletes, not knowing what the day will bring, but there, having worked so hard to get to that moment. The best part? 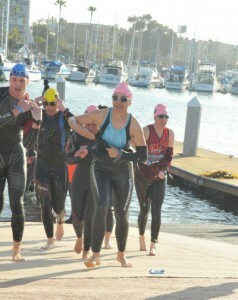 We were still waiting when the pro men and women started exiting the water. 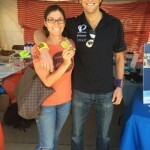 Andy Potts was this close as he ran by and smiled. So handsome, this man. 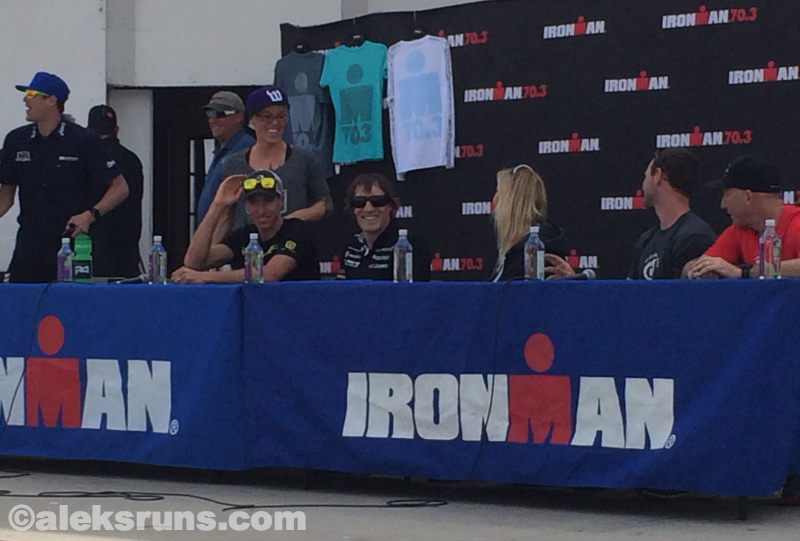 Photo from TYR – not from this year’s race, but I had to show you visual proof of his handsomeness, didn’t I? Finally, it was time to take off the ol’ socks and head in. It wasn’t that bad! I don’t know if it was because everyone peed in that water before their start or what, but it felt great. Refreshing! 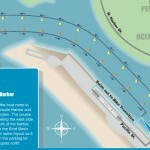 This race has a deep-water start, which means you get in, swim to the start buoys and wait about three minutes for the gun. What an amazing three minutes! Floating in your wetsuit, unsinkable, just chillin’ – ha, I made a pun! But really, it wasn’t cold. It was nice. Then, BOOM! Gun goes off and the mumbo-jumbo of hands and feet angers the water as we all start swimming. I found some space soon enough and made it my life’s goal to keep up with the people in my wave and try to have some feet ahead of me to draft off at all times. Left-right, breathe, left-right, breathe, left-right, breathe, look around. Left-right, breathe, left-right, breathe. Then: a red buoy! 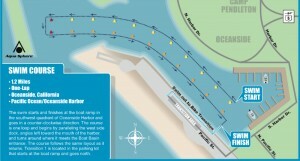 On the map, the swim course is marked by yellow buoys on the way out, red ones on the turnaround and orange ones on the way back. Was I at the turnaround point already? That was awesome fast!?! So I looked at my watch. Three minutes. Nope. 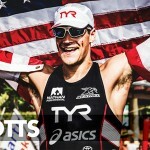 Not even Andy Potts could swim so fast. Carry on. Left-right, breathe. Left-right, breathe. I wonder if there are sharks around here. Oh, no! Don’t think about sharks! Think about something else, like coffee. Shouldn’t have had two cups this morning, now I gotta pee again. Where is that damn turnaround? Ah, here it is. Why is it so long, when do we head back? I wonder if my family’s watching from somewhere. They could probably see the sharks, if there are any here. Ugh, this water is so salty. Oh, hey! the announcer! I hear music! We’re close! By the time I put everything in there and made sure nothing was left out in my little rack space, I had spent quite a while in T1: 8:09 minutes! You’d think I blow-dried my hair or something. But really, I just put on my arm sleeves (the morning was still a wee bit chilly), gobbled up half a banana and headed out. Beautiful bike course. About half of it is in Camp Pendleton, which is closed to civilians – so that was a treat, to ride closed-to-traffic roads and enjoy amazing mountain views. Bliss! I had studied up the course and read that people who push too hard in the first 25 miles – all flat and fast – suffer on the climbs that come once you enter the base. So I biked conservatively and enjoyed the sunny weather. At the first aid station – Mile 15 – I stopped to take advantage of the porta potties and, I kid you not, peed for two and a half minutes straight. I know this because I left my Garmin running. That was probably the only PR I set that day. I made sure I took in a sip of my energy drink or a Cliff Shot Blok every 10-15 min. The task was to have emptied three bottles (two energy drink, one water) and eaten at least 3 packets of bloks by the end of the bike, and I was working at it! I was really multi-tasking on this bike, what with sight-seeing, bike-gazing and singing loudly to myself. I’m sure that alone gave people incentive to pass me quickly – you’re welcome! The first big climb came at mile 25 – about a half mile at a 10-12 gradient. 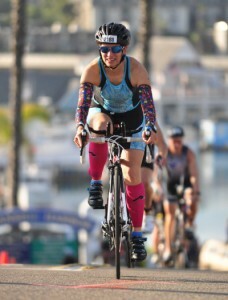 I switched into the smallest gear and pedaled on — it wasn’t so bad! Why so many people dismounted and walked their bikes up the hill, I don’t know. Strategic decision to conserve leg power? I admit this worried me a little. What do they know that I don’t? But that first climb – the worst of the three big ones on the course – was over quickly and from then on, mostly pleasant rollers followed. People walked their bikes up the second and third climbs, too. Weird. 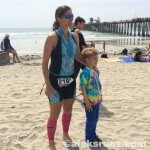 I was still feeling great, eating my bloks, drinking my drinks… I could have used some more chamois butter from mile 50 on, but nothing too horrid. That is, until my stomach started cramping. I blame one of the two energy drinks I carried for this: a bottle of Hammer Perpetuem, which I’ve used multiple times on long rides, but never so late in the ride (in the last 10 miles or so), and never before running a half marathon. Hammer Perpetuem has a solid protein content and some fat, which probably locked up my stomach and prevented it from digesting the carbs I needed for energy. 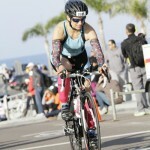 By the time I reached T2, I was quite ready to get off this bike… but not really sure I wanted to run. Shame, because I’d been looking forward to the run all day long. But my stomach was already bloated and cramping and I knew things would get rough very soon. Ran to the porta potties just in case, packed four (4!!!) Hammer gels and off we go. What can I say. This was the toughest, most challenging run I have ever done in my life. Ever. I felt on the verge of puking most of the time, and now that I’ve looked at my Garmin data (I didn’t set it properly, it seems, as it measured the whole thing as a swim, so I wasn’t getting pace/ speed info on the go) – I know I paced myself very badly. 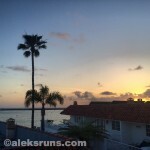 I ran the first mile at an 8-min pace, an unwisely fast pace for me. Yet it’s very normal: when you’ve biked for more than three hours, your brain just wants to keep moving as fast as possible. One of the short, but annoying inclines we had to climb on the run. (And my thumb in the corner, sorry about that.) Photo from the day before the race. But I hardly noticed all that beauty. 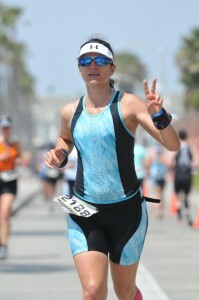 My stomach hurt and I wanted to hurl – especially after downing one Hammer gel around miles 2-3. Why did I decide I needed more “food” at this point is beyond me. 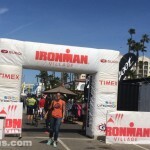 I guess at Ironman events, people just do stupid things sometimes. And all around me was a battlefield. Decidedly not what I’m used to seeing at “regular” half marathons, i.e. people running, energetic, excited. Nope… This was one exhausted crowd of wounded warriors. So many walked. Limped. Stopped to bend down and stretch cramping limbs. I actually tried to smile for the photographer here. With some degree of success, I guess? I knew I needed some more sugar in my blood, but couldn’t bear the thought of more gels, so at each aid station, I’d take a cup of coke. Bless Coke!!! It does wonders to calm a sick stomach and the caffeine helped as well, I’m sure. 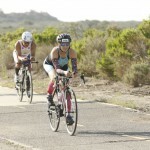 I was cursing myself for forgetting my salt packets in my transition bag. I needed that salt! The course is two loops, so at miles 6-7, you are basically running by the Finish and listening to Mike Reilly announce finisher names. So that was cruel, but what can you do. There, I saw three young folks in red T-shirts that said Medical and asked if they had salt. They didn’t, but one of them offered very kindly to run over to the food tents at the Finish and grab me some, if I was willing to wait. You bet! Three or four minutes later – I don’t remember, but taking a stretching break was nice! – the gal showed up with a small container filled with salt and it was the best thing I’d ever put in my mouth. I was able to pick up the pace for the next three or so miles and run nonstop. Mile 10, Mile 11… at this point, more and more people were walking and I just kept thinking how I wanted this to be over. But then I told myself: you trained for this for four months. You woke up at 5 a.m. to swim; worked out twice a day; went five weeks without a rest day… and now you want it to be over? You only have two miles left – two miles! – and it will be over. So enjoy it! And I did! The last two miles are by the water and the wind had picked up, but the cheerers were loud, the Coke was delicious and, despite my nausea, my legs were feeling fairly OK.
Past mile 13, I could see the Finish shute and hear Mike Reilly, and I almost cried. But then he butchered my last name again and I found that very funny. Oh, Mike. You better learn how to pronounce it for when I do an Ironman one day! 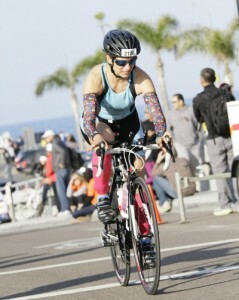 A spectator reminded me to bring my bib to the front for the photographer (thank you! ), and I decided last-minute to also take off my visor so it doesn’t get in the way of my beautiful (um… not) face in the finisher photo. Except I didn’t do it soon enough, so… And there you have it, my first-ever deodorant commercial (thanks, Jill!) Mmmm armpit. Smells good. My official run split was 2:13:37, which surprised me. For sure, I thought I’d been out there for at least three hours. But, I guess, time goes fast when you’re having fun! I was really hoping to get my first 70.3 in under 6:30, but hey: there’s always next time, at Vineman 70.3 in beautiful Napa. Can’t wait! 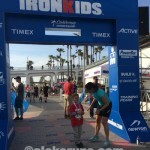 Best part of the race: barefoot beach walk with the Ironkid! Aw, you are too kind! When are we running a race together? Big Sur? 2015? What an amusing recap. Congratulations on such a tremendous accomplishment! Congrats! 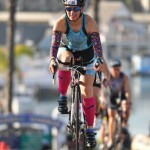 So excited to read your experience as I am getting ready for my first 70.3 next weekend. Squeeeee! Great job. Thanks! Enjoy and good luck! Love your recap! 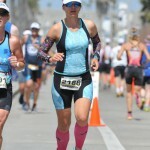 I’m doing my first 70.3 this fall – Ironman 70.3 Augusta. I was entertained by the thoughts going through your head during the swim. My problem is I’d never remember all that later on to type up! I was so glad to read your play by play of it and it gave me a lot to look forward to, and stuff to think about being realistic about. Glad it was helpful! 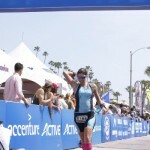 All I can say is, pay *special* attention to nutrition, it really is the fourth discipline in triathlon. 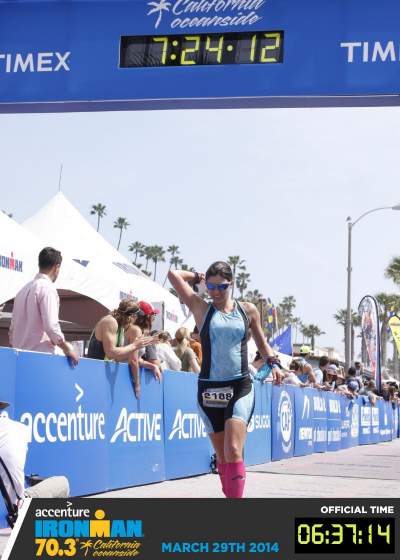 What you eat before and during the race can totally make it or break it. So, SO important!